There was a time in Paul Quarino’s association with the Egyptian Theatre that his co-workers at Hillsboro’s Rodgers Instruments thought there must be something or someone pretty special in the Coos Bay Area, given his frequent week-end trips to the South Coast. 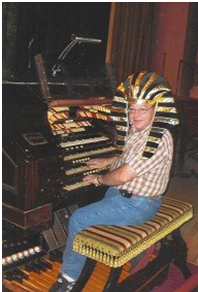 Little did they realize the reason that drew him then, and has continued to draw him for some 33 years now, is his special relationship with the Egyptian’s Mighty Wurlitzer pipe organ. Paul is a master at keeping the 92-year-old instrument, original in its installation, playing and in working order. For 30 plus years Paul has made the trek to Coos Bay after Thanksgiving and before The Sounds of Christmas concerts to ensure that the organ is playable and in tune. He has given generously to the Egyptian of his time and expertise. In addition, over the years Paul has presented concerts and silent movie events at the Egyptian, playing the film accompaniments on the Wurlitzer. His devotion and long service to the Egyptian have earned him the Golden Charioteer designation. Born in the Midwest, Paul studied music at the MacPhail College of Music in Minneapolis, and he has a degree in music education from the University of Wisconsin. For many years Paul performed as a Wurlitzer Concert Artist and is fondly remembered by many as the musical director and organist of the former Organ Grinder Restaurant in Portland. Most recently, he retired after 16 years as Musical Product Evaluator at the Rodgers Instruments Corporation. Paul is a lifetime member of the ETPA.